a brief introduction to propagation and the major factors affecting it. In addition to auroral activity, these variations to the magnetic field can cause those electrons spiraling around magnetic field lines to be lost into themagnetotail. With electrons gone, maximum usable frequencies (MUFs) decrease, and return only after the magnetic field returns to normal and the process of ionization replenishes lost electrons. Most of the time, elevated A and K indices reduce MUFs, but occasionally MUFs at low latitudes may increase (due to a complicated process) when the A and K indices are elevated. Each day the Space Environment Center (a part of NOAA, the National Oceanographic and Atmospheric Administration) and the US Air Force jointly put out a Solar and Geophysical Activity Report. The current and archived reports are on the Near-Earth Data Online at SEC page in the "Daily or less" section in the "Solar and Geophysical Activity Report and 3-day Forecast" row. Each daily report consists of six parts. WWV at 18 minutes past the hour every hour and WWVH at 45 minutes past the hour every hour put out a shortened version of this report. A new format began March 12, 2002. The new format gives the previous day's 10.7-cm solar flux, the previous day's mid-latitude A index, and the current mid-latitude three-hour K index. A general indicator of space weather for the last 24 hours and next 24 hours is given next. This is followed by detailed information for the three disturbances that impact space weather: geomagnetic storms (caused by gusts in the solar wind speed), solar radiation storms (the numbers of energetic particles increase), and radio blackouts (caused by X-ray emissions). For detailed descriptions of the WWV/WWVH messages, visitwww.sec.noaa.gov/Data/info/WWVdoc.html and www.sec.noaa.gov/NOAAscales/. Normal propagation (no disturbances) is expected when the space weather indicator is minor. A comment is appropriate here. 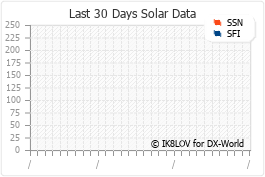 Both the Solar and Geophysical Activity Report and WWV/WWVH give a status of general solar activity. This is nota status of the 11-year sunspot cycle, but rather a status on solar disturbances (flares, particles, and CMEs). For example, if the solar activity is reported as low or minor, that doesn't mean we're at the bottom of the solar cycle; it means the sun has not produced any major space weather disturbances. For short-term predictions, the use of the effective SSN (SSNe) may be helpful. In this method, an appropriate SSN is input to the propagation prediction software to force it to agree with daily ionosonde measurements. Details of this method can be found at www.nwra-az.com/spawx/ssne24.html.